So, the story at hand. Just before the November Sweepstakes contest, I put up a secondary 80-meter antenna—the open-wire fed dipole I used at K8GU/9. Its performance was underwhelming and the vertical seemed to play just fine. But, I got busy and just left it up in the trees. 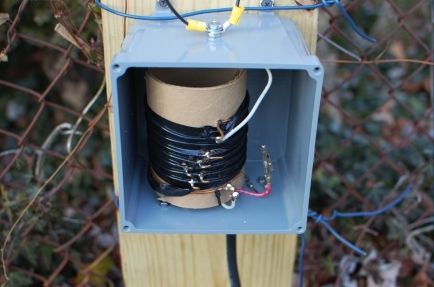 Somewhere in the annals of the Blog, I may or may not have described this antenna, which was designed to also operate on 160 by shorting the feeder and feeding the whole mess against ground. I never used this functionality because I had to lay radials on top of the patio and that was a pain to take them up and put them down. 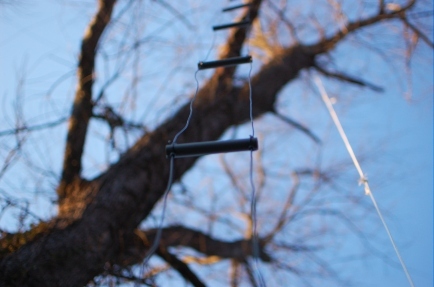 The North American QSO Party was this weekend and I’ve been participating in the NCCC Sprint Ladder, both of which include 160 meters. Around about last Thursday, after the NS Ladder, I decided it might be fun to have 160 for the NSL and NAQP. So, I ducked out of the office early on Friday afternoon and set about stripping the old tuning network from the K8GU/9 incarnation of the antenna. The coil has four taps on it. I clipped the fourth tap, shorting the bottom half of the inductor and did the VSWR sweep, finding a dip at 1.950 MHz or so. Each successive tap brought the minimum lower and lower. With no taps clipped, it was tuned to the bottom of the band. I got lucky (erm, did a lot of tweaking at the previous QTH). The best news of all of this is that there is enough RF actually being radiated (not just as heat, either!) to make some contacts! Further good news is that even though the antenna is between three and five feet from my 80-meter vertical, with the W3NQN filters, I can operate SO2R on both bands simultaneously. Of course, the RX noise level may just be hiding the trash. I haven’t tried the K9AY because I had that portion of the station torn-up during the conversion of all my DC accessories to PowerPoles and the preamp popped a fuse in my RigRunner when I plugged it back in. The bottom line is that it’s not a full-sized 4-square, but it gets me on 160 from my lot in a way that’s compatible with my operating style.